Why HLCC Hawaii is the best! We encourage you to call 1-808-988-0800 right now for a free phone consultation with one of our hair loss treatment specialists who will help you to determine the best hair loss products and hair loss treatment programs that will address your specific hair loss condition. You may also call to schedule a free consultation in any one of our hair loss treatment clinics to meet face to face with an expert who can guide you in your purchase of any hair loss treatment regimen or hair loss products. 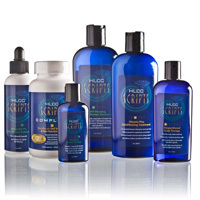 Browse through our hair loss products below or use the links on the left to choose a hair loss treatment category or other products that may interest you. HLCC has found that the more someone does, in conjunction with laser, the better their results will be. The Comprehensive Program brings together all the best products including FDA approved ones, with the latest research from the US, Europe and Canada. HLCC Scalp Therapy Improve the scalp environment,by dissolving sebum build-up, enabling the penetration of Minoxidil or other topicals. Minoxidil is the only topical hair product FDA proven to stop hair loss and to re-grow hair in both men and women. Clinical research shows that increasing the concentration of Minoxidil from 2% to 5% will improve the quantity of hair growth, while simultaneously decreasing the length of time for successful results. We see much better results in our clients with higher strength 10% TO 15% Minoxidil and by adding 5% Saw Palmetto to block DHT (the leading cause of hair loss).